There was an understanding, an unwritten contract, of how things were run and who took responsibility for the daily arrangements. Though their relationship was rooted in their past in Poland, it was in Britain where it was cemented. Karol knew the Kulesza brothers were people who offered no apologies for how they preferred to execute his business decisions. He was not quite sure of – or chose to deliberately ignore – certain facts about their cruel actions, how quickly their behaviour could escalate into violence. Of course, he knew they had a limitless capacity for falling into fierce darkness. Impassioned with a blazing commitment. Madmen. It took a savage, evil-eyed heart and soul to be like the Kulesza brothers. Karol accepted he was nothing like them but he needed their dedication. For he could not do what they were capable of, so easily, it seemed. The first thing the Kulesza brothers did was to take their passports away, when all the passengers were still exhausted after a 28-hour coach journey, relieved they had finally reached their destination. Though glued to the windows expecting a glimpse of a postcard image, the Tower Bridge or Buckingham Palace or any other building they memorised back at home, they saw instead Mezopotamya shop and Ali’s Kebab Centre, a mother clad in a black cloth with three children at a bus stop, African and Asian faces, Middle Eastern faces, but no English ones. What exactly did an English person look like? They did not know. Something else briefly lodged in their stomachs, a flash of anxiety, a fear of overwhelming possibilities, and if they did not stick together here they would dissolve into nothingness. When they finally arrived at Victoria Coach Station and Igor bellowed through the voice announcement system ‘Welcome to London,’ some passengers clapped as if they were on an airplane, not on Milena’s Travel coach. Kętrzyn, Bartoszyce, Biskupiec, Ełk, Bydgoszcz, Poznań, Słubice, Leverkusen, Calais, Dover, Maidstone, London. Bloodshot eyes. Cramps. Sweaty bodies. They had finally made it. Most passengers disembarked during the 15-minute break. The ones who travelled on Karol’s orders were rushed back inside. Their final stop, ‘Greenford’ was another good hour’s drive away. There was a large terraced house on Greenway Gardens. It had white walls, a double-glazed porch entrance, attached garage, all its windows covered with thick lace curtains. This was the place where four men and two women followed Damian, after Igor stopped at the bus station on Ruislip Road. Igor did not help anybody to unload their luggage. He stayed inside, with his wrists propped on the edge of the steering wheel, an unlit cigarette between his fingers, whilst Damian hurried everybody to pick up their bags and follow him. The Kulesza brothers called it the Greenford House, one of the many drop-off rented accommodations across London for the Poles they transported to Britain. There were others. It was Karol who had named them after neighbourhoods; Hounslow, Barking, Neasden, Bromley, Mitcham. A series of temporary homes for temporary people. The only thing they would remember about Karol would be his name, his carefully constructed identity, the story of his non-existent life. He skilfully navigated the space between his necessary lies and the half-truths. He believed them himself. Though Karol’s lies did not stay close to the truth, they resembled a reality he liked to control, and so the lies moulded into fact. He had developed the most effective method of constructing his multiple identities, appearances of truth for the interest of his victims and, of course, to ensure his own profit. Their purpose was but entirely according to his will. And if, by some strange chance, he tripped up, because he forgot what he had told one person, he blamed the listener through either immediate attack or swift denunciation of his story, but never by admitting it as his own mistake. Karol knew that tendency in people – as long as no one could ever be sure what they really remembered – he blamed the other person, in case somebody pointed out some discrepancy in his version of reality. They listened tensely to Karol speaking, his chin thrust out, and hands repeatedly emphasising his words. The rapid, unconscious arm movements helped him to concentrate. ‘We’re going to arrange National Insurance numbers and bank accounts. This is important before you begin working in this country. I will collect your passports so that I can start setting you up as soon as possible. Before Karol left he insisted on inspecting bathrooms, to make sure they had enough toilet paper and toiletries, that the kitchen had a kettle and supply of teabags, coffee and sugar. He showed them the television in one of the rooms with Polish channels, and there were Polish magazines for them to read, if they got bored sitting in the house, waiting. Of course, they could go for a walk tomorrow, to have a look around the area, but he would rather prefer them to stay inside, for their own safety. On the way out, he made sure he shook each hand and promised to be back as soon as he sorted their paperwork. ‘What’s with the concern?’ Damian asked sharply when they were outside. ‘Simple psychology,’ Karol said. For all his usefulness, and ruthless loyalty to his business, Damian failed to grasp Karol’s strategy which he had so carefully implemented during the past few months. But then, Damian’s analytical skills were not the reason why Karol had introduced Damian into this business. How could he possibly explain to Damian that yes, money was evidently the motivating factor behind human behaviour, but more than that, it was the level of power that came first. Damian, like others Karol had come across, was delusional thinking that money was the ultimate motivator. Harnessing the power over people’s naivety, altering their lives at will, controlling people’s perception was what really excited Karol. And, naturally, money followed. Karol lusted for absolute power. There was nothing in him, just this desire, nothing but the insatiable craving to control others. Money was a tangible outcome of Karol’s excellence in manipulating people, his exceptional talents. Because it was his sole motivation he could not imagine there was anything else worth fighting for in the world. A.M. BAKALAR was born in Poland and lives in London. Her first novel Madame Mephisto was published in 2012 and was a reader nomination for the 2012 Guardian First Book Award. In 2015 her short story ‘Woman of Your Dreams’ was broadcast on BBC Radio 4 and her writing has appeared in The Guardian and The International New York Times. She has also appeared as a guest on BBC Radio 3 Night Waves, Proms Plus Literary and BBC Radio 4 At Home Abroad. 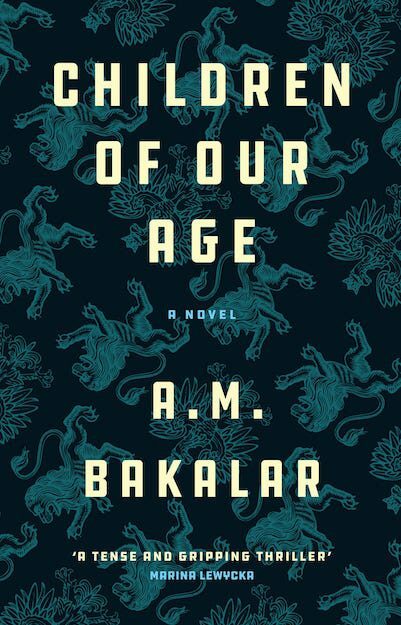 A.M. Bakalar’s second novel Children of Our Age is published by Jantar in October 2017. An excerpt from Willie Davis's forthcoming novel, "Nightwolf"
Hasil knows that they might succumb to the cold and not make it. He prefers not to think about that eventuality and takes them along the forest trail. He’ll risk it. So long as the patrol times haven’t changed, they ought to make it.